3/21/2013Share this story on Facebook! I know I’ll never be a professional athlete, but sports have always been a huge part of my life—whether I was playing on the field or accompanying my dad to his various jobs in the industry. After I graduate from IC this semester, I hope to find a job in either sports sales or marketing, and my internship experience while at Ithaca has given me an incredible start. When I first heard of the Ithaca College New York City (ICNYC) program, I knew it would be my ticket to the start of my dream career. The semester-long program centers on an internship and coursework. Once I was accepted into the program, I immediately began applying for a number of different sports internships in the city. My number one pick was Madison Square Garden (MSG). 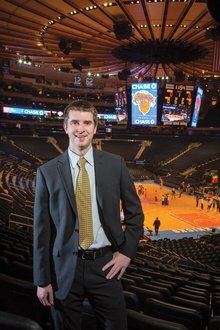 The possibility of an internship at MSG attracted me from the beginning, and, with the help of a contact I made at a previous internship, I was able to get my foot in the door at the "World’s Most Famous Arena." Before long, I was working behind the scenes of the New York Knicks, New York Rangers, and New York Liberty franchises. MSG is a world-class facility, and I knew my experience there would be invaluable. As someone who was born and raised in Boston, I had a little bit of an adjustment to make in being around New York sports fans. I was able to put my loyalties aside though because I recognized how fortunate I was to work for this respected venue and these successful franchises. You could say that I hit the internship jackpot. Just as the games at MSG are fast-paced and ever changing, so was my work. Some days I’d work on just one specific project. For example, I researched the NBA’s influence in China and passed the information to my boss as he prepared for a meeting with Chinese clients. On other days I’d be in the office doing a number of things to get ready for that night’s game. It wasn’t always a nine-to-five job. My boss would often entertain people for Knicks games as a way to facilitate business. It was largely my responsibility to meet potential partners and clients as they arrived and bring them to the court to watch warm-ups. This was my favorite part about my internship because in many cases I was making dreams come true! Kids and parents alike were beside themselves to get close to Knicks players. It reaffirms my desire to go into sports because it is an industry that positively affects so many people. Aside from my decision to attend Ithaca College, I know that enrolling in the ICNYC program was the best choice I could have made to get my career started. Although I had studied abroad in London, living in New York City was unlike anything I had ever experienced. The pace of the lifestyle was truly unique. If you want to challenge yourself, seek out an experience in the city. The ICNYC program bolstered my confidence about my career choice. I know that whatever my first job will throw at me, I have probably experienced it in some capacity at MSG—and I will say just that to my future interviewers. My time at MSG has given me a snapshot of the kind of career in sports marketing the future holds for me. I thank Ithaca for giving me this unbelievable opportunity. If it were not for the college’s decision to charter this program, my path toward a sports career would be drastically different. If you have the chance to take advantage of this program, don’t hesitate to do so. The investment you make will pay multiple dividends in personal development.